This is a very unusual and exciting hunt. It is community based and promotes conservation and sustainable development. I was overwhelmed by the fact that after this strenuous climb and the last days I could have the chance to kill this amazing Ibex. It was incomprehensible, I can hardly believe it and i´m really gratefull about everything. This remote area is part of a snow leopard conservancy. Their conservation model that they use to protect the wildlife, not using the wild game as a food source like many other countries was amazing. The hospitality, work ethic, team work all exceptional. It's a tough hunt - a day to hike into base camp but I killed an exceptional quality ibex on my first day in route to the 2nd camp. I cant say enough great things about the people, they work very hard to make sure you're happy. After the hunt they took us to the hot springs to relax. 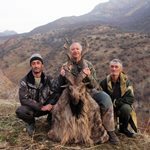 I plan on returning to Tajikistan to hunt with this outfitter again. Unfortunately my friend lost our bags flying with Turkish Air. It's important to keep a full set of clothing in your carry bag. It's very tough to replace your gear in that part of the world. i'm very lucky the temperatures weren't that bad, but my friend also killed his ibex on the very first day. This hunt was as challenging as any hunt I have been on. Our guides worked extremely hard for us and we're very patient with me to help me be successful. The thin air made it very difficult to climb but I just had to go at my pace. Abundant game, challenging hunt, all at a very reasonable price. Game was plentiful, guides were focused on clients needs and took into account hunters shortcomings. Very genuine,very friendly, and very focused on your success.. H&CT has been very effective at bringing ibex, markhor, and Marco Polo back to sustainable numbers. From the time we landed in Dushanbe to the time when we left... we felt at all times very safe and very welcome. Entry and exiting of country was extremely well organized and very efficient. Drivers were very good and vehicles had seat belts and good tires. People were very kind, helpful, and treated my wife and I like royalty. Great help from everybody. Very warm welcome et fantastic seeneries. THe mountain range is impressive especially with the wolves howling in the background. Many trophy animals. Get ready for long distance shooting. Accomodations a bit rough when camping at the top of the mountain. Coming to Central Asia was a new experience for me. The crew at H&CAT worked tirelessly to ensure our comfort and safety. The unique villages, strenuous hunting and beautiful trophies made for a trip of a lifetime. It was definitely the most difficult yet most rewarding hunt of my life! I highly recommend this hunt to anyone looking for a new challenge! 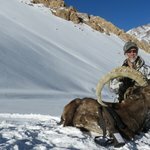 In September 2018 I hunted ibex in the Parcham Conservancy of Tajikistan through H&CAT. This hunt is not for everyone. But if you are in good shape, love the mountains, and want to truly experience the culture and lifestyle of central Asia, you will find it to be the experience of a lifetime. 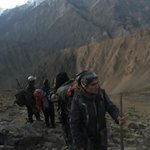 I will never forget the kind, generous people, the amazing wildlife, and the stunning beauty of the high Pamirs. I have a fair amount of mountain-hunting experience in North America and elsewhere, and this was by far the most physically difficult hunt I have done. 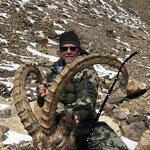 My hunting partner and I were both successful on ibex, taking them at an elevation of more than 16,000 feet after several days of tough climbing and hiking. Ibex are magnificent game animals. Get in good hiking/climbing shape. Prepare for long shots. The time of year you go makes a big difference--early in the season it is much more difficult. We were there at the end of September; it was still warm and there was no snow, and the ibex were very high. Once the snow flies, ibex will move lower, and you won’t have to climb as far. The conservancy guides in Parcham were outstanding. They know these mountains intimately, but just as important, they understand visiting hunters. They have an excellent feel for the pace at which you can hike, and will adjust and care for you accordingly. We stayed in a home in the village, and also spent several nights camped out high on the mountain in a small tent. Even in the village, do not expect indoor plumbing, a great deal of privacy, or other comforts you might be used to. Do, however, expect the kindest, most generous people you have ever met to open their homes to you, share with you what they have, and be your hosts and your friends. The people of Tajikistan are welcoming to hunters and to visitors in general. They take pride in their country and their culture. Everyone we met, in the airport, in the villages, and in the city of Dushanbe, made us feel safe and welcome. Be prepared for a very long, rough drive from Dushanbe to the conservancy and back on the infamous Pamir Highway—an adventure in itself. By participating in this hunt, you will be supporting one of the finest hunter-funded conservation projects in the world. H&CAT’s work in setting up and supporting local conservancies has resulted in healthy and thriving populations of ibex, snow leopards, and other species. 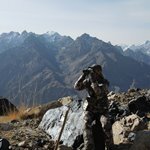 The money you pay goes directly to the local conservancy where you hunt—not to an outfitter or middleman--providing direct financial support to the local villages, whose inhabitants are now the greatest champions and protectors of Tajikistan’s mountain wildlife. Honestly, I don’t have any complaints. I was hoping for a great mountain hunt and that is exactly what I got. We saw plenty of ibex covered a lot of ground and I was able to shoot an exceptionally good ibex. I would definitely recommend this hunt to anybody who is looking for a great mountain adventure. Everything from the planning of the hunt to the actual hunt and all the paperwork involved in getting my trophy back into United States went flawlessly. The camp staff, guides and interpreter were all extremely friendly, courteous and kind. Overall just a wonderful experience. From what I understand, this year there was an exceptional amount of snow in the mountains. I would have liked to experience this hunt without as much snow, LOL, at times the snow was anywhere from 12” to 24” deep which made the hiking difficult at times.